Polytetrafluoroethylene (PTFE) is a synthetic fluoropolymer of tetrafluoroethylene that has numerous applications. PTFE is a fluorocarbon solid, as it is a high-molecular-weight compound consisting wholly of carbon and fluorine. PTFE is hydrophobic: neither water nor water-containing substances wet PTFE,. PTFE has one of the lowest coefficients of friction of any solid. We deals in wide range of products made from PTFE material. Our company is one of the leading Suppliers of PTFE Rods. It is used to produce bearings because of its very low friction and also for its free running ability. PTFE Molded Rods can easily be machined but due to the surface softness, care must be taken in lathe jaws or high compressive loads, which may cause distortion. 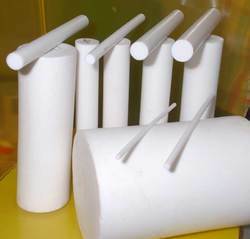 Another important element to remember regarding Ptfe Plastic Rods is the coefficient of expansion due to heat changes. We are counted among the leading Ptfe Plastic Rods Manufacturers. PTFE Rod is often chosen to produce bearings because of its very low friction and also for its free running ability. Because of its ability to conform to shape otherwise known as flow, PTFE Rod is used for seals in valves, this is because it can conform to shape and create a high specification valve seal. PTFE Rod can easily be machined but due to the surface softness, care must be taken in lathe jaws or high compressive loads, which may cause distortion. Another important element to remember regarding PTFE Rod is the coefficient of expansion due to heat changes; this can be uneven with PTFE and may cause distortion in components. 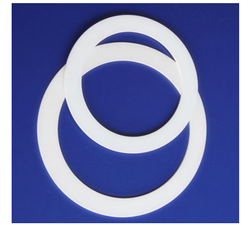 Our specially manufactured PTFE Ring Gaskets are widely used in chemical plant, glass lined equipments, etc. due to their high temperature, corrosion and ageing resistant qualities. We are one of the leading exporters of PTFE O Ring Gaskets Exporters. Our company has been renowned widely as one of the leading Suppliers of Solid PTFE Ring Gaskets. These gaskets are successfully used in chemical plants, glass/glass lined equipment due to their high temperature, corrosion and ageing resistance. Envelope Gaskets are produced in two forms: - Milled Slit forms. Milled type envelope is perhaps the better of the two since it is made it fit the insert and present a flat face to the flange. The slit type is perfectly arrogated for many applications where cost is a major consideration. The envelope in this variety does not present a full face to the flange. Solid gaskets can be made to order in different types of shapes and sizes. Our PTFE Balls are perfectly used, where metals or alloys cannot be used. 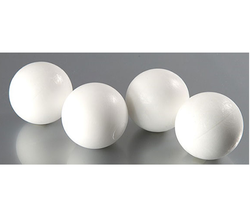 PTFE Plastic Balls are highly functional in self-lubrication conditions such as ball bearings. Today, we are counted among the key PTFE Balls Manufacturers and Suppliers in India. The PTFE ball is a unique product. It has many advantages in applications where metals or alloys can not be used. PTFE balls are highly functional in self lubricating conditions such as ball bearings. In the fluid handling industry PTFE balls are used in ball valves that have contact with extremely corrosive liquids. PTFE ball has reduced maintenance costs and man hours in the field by eliminating the replacement of valve components subjected to corrosive environments. We are one of the most recognized Virgin PTFE Bellows Manufacturers and Suppliers in India. PTFE Flexible Bellows are specially designed from virgin PTFE and counter molded. Our manufacturing process ensures excellent quality of PTFE Flexible Bellows providing durability and low maintenance cost. Bellows are specially designed from virgin PTFE and is contour moulded. This manufacturing method guarantees an excellent structure of the material; symptoms of ageing are practically excluded. Very long term durability and low maintenance cost are assured.Bellows serve for compensation of vibration, thermal strain expansion and Axial Redial motion. For use with piping and equipment made of glass, enamels and ceramics we recommend PTFE Gaskets, offered as accessory. The sealing surfaces are covered end plates and individually boxed for protection against mechanical damage.Limit bolts are preset to prevent over extension during operation. Adhesive PTFE Thread Seal Tape is produced from pure PTFE. Higher the density of Premium Ptfe Thread Seal Tape, more will be the flexibility and improved diffusion seal capability and easier to work with. Polytetrafluoroethylene Thread Seal Tape is used for sealing threaded joints. It is widely used in water plants, cooling and steam system, system of compress air etc. It is also very much useful in hygiene oriented places like hospitals. We are counted among the leading Plastic Thread Seal Tape Exporters in India and abroad. 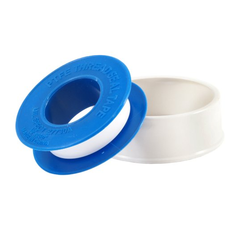 We keep a wide range of PTFE Thread Seal Tape of various width and sizes. Generally you can say about thread seal tape that the higher density (g/cm.3) the better product, that means more flexibility and Improved diffusion seal capability, and In, addition, it makes the tape easier to work with and more economic In, use. Trinity is recommended for natural gas, Gem is recommended for liquid oxygen,.- see separate data sheets. All the above thread seal tape Is available in, 19mm § 25mm In. width also. Klooper, Stanley, Inwin AAA are applied for the sealing of threaded joints on, system for water, compressed air, cooling and steam system and hydraulic systems. Applicable on, all types of materials like Iron,, metal, plastic, fibre etc. Trinity Gem. are suitable for steam,, chemical, Acid, base solvents this product are very diffusion proof and is therefore suitable for oil and also for hydraulics, Petrol Diesel,. Thread seal tape Is also suitable on, systems where heavy hygiene requirements are made (hospital, food Industry etc). Remove any dirt and metal shavings from the thread before application of PTFE tape. Put the tape on the thread joint In the direction of Inclination of the thread. Apply the tape with an even; firm pull to be tight fitting about the thread. Dependent on wanted thickness of layer the overlap should be from. 1/2" to 1" tape width Trinity Gem Is used alone and without any use of sliding agents. 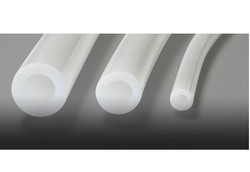 PTFE Thread seal type is available in variety of widths, lengths to meet your specific requirements. Standard Packing ¿¿¿" ¿¿¿" 1"
Carton 3200 Nos. 2400 Nos. 2000 Nos. Approx. Wt. Of Carton 40 Kgs. 45 Kgs. 50 Kgs.